Autumn is here, guys. There’s no way to show off in summer clothes anymore. In less than two weeks, we had to swap our light jackets for fresh evenings for down jackets, including hat and gloves. I have hardly no more arguments for winter. Well, it’s the perfect kind of weather to go to the museum, so we went to see the exhibition Monet. Beyond impressionism at the Ordrupgaard Museum, near Copenhagen. I will spare you the 30-minutes bicycle ride to go there, the rising false-flat, the five degrees Celsius, the mobile phone in one hand to find the way, the coaster brake to manage, and the rules of the cycle lanes not to forget in any case. I’d rather tell you about this beautiful painting exhibition that we saw after we got there, red-faced, dishevelled and wet. Scandinavia’s biggest Monet exhibition, by the way. I have always enjoyed looking at paintings: the colours, the shapes and the feeling I have in front of them. But I used to wonder whether I could give an opinion about works of art, or in particular about a painting as this is what it is about. It’s true that art can be snobbish. What would be best to think of a painting, especially if it’s a masterpiece? Unless we are initiates or experts, are we really entitled to say whether a work of art is beautiful, ugly, well executed, ambitious, innovative or whatever else? What really counts? Today, I am more experienced, but still not an expert. However, my relationship towards art has radically changed: it’s clearer. Now when I look at a painting, what is important to me is simply what I feel. It’s the emotions that it arouses in me, the way I get carried away or whether it leaves me completely cold. What matters is how I perceive it, and not how I should because some experts analysed it that way. I don’t either say that I’m not interested in getting their viewpoint, but I don’t underestimate mine anymore. I think that appreciating art simply comes from the very intimate relationship we have with the work of art we are looking at. So I’m going to share what I liked and what touched me in this beautiful exhibition Monet. Beyond Impressionism. No more, no less. Just to give the setting. This exhibition focuses on the series of paintings made by Monet, and displays some of the most famous ones: the Waterloo Bridge, the Rouen Cathedral, the Water lilies, and the Haystacks. It gathers Monet’s paintings coming from the most famous museums worldwide— The Metropolitan and MoMA in New York, The National Gallery in London, the Musée d’Orsay in Paris and The National Gallery of Australia in Canberra. It’s a rare opportunity to be able to see all these paintings all together here. Grainstacks, Midday, 1890, National Gallery of Australia, Canberra. The light. Fabulous. I wonder if Monet’s paintings light up when plunged into darkness, as they are so luminous. When watching closely, we see bright colours such as green, yellow, red, and pink. Standing further back, we see dawn, dusk, haze, life, and nature that is growing. The paintings look so real that we could almost feel the cold wind sweeping along the coast of Normandy. Vétheuil in summer, 1879, Art Gallery of Ontario, Toronto. Customhouse, Varengeville, 1882, Philadelphia Museum of Art. The Doge’s Palace seen from San Giorgio Maggiore, 1908, The Metropolitan Museum of Art. Rough weather at Étretat, 1883, National Gallery of Victoria. The Series. As said earlier, Monet worked on series of paintings. He painted up to 30-40 times the same scene at different times of the day and the year, working tirelessly on colours to recreate the light, the atmosphere, and the transience of the moment. It’s precisely in that that the exhibition is interesting and enables us to understand his work and the talent he used to accomplish it. It’s also with these series that Monet innovated from his fellow impressionists when later he worked on more abstract patterns. Rouen Cathedral. The Portal, Harmony in brown, 1892-94, Musée d’Orsay. Waterloo Bridge, ca. 1903, Carnegie Museum of Art, Pittsburg. Waterloo Bridge, Overcast, 1903, Ordrupgaard. The movie. A documentary projected in a small dark room next to the conservatory tells about his life, his influences, and his evolution as an artist. It puts the paintings of the exhibition back in the context of their creation and shows the different places where Monet lived and which modelled his painting—and in particular his famous house in Giverny (Normandy, France), which now houses the Fondation Claude Monet. 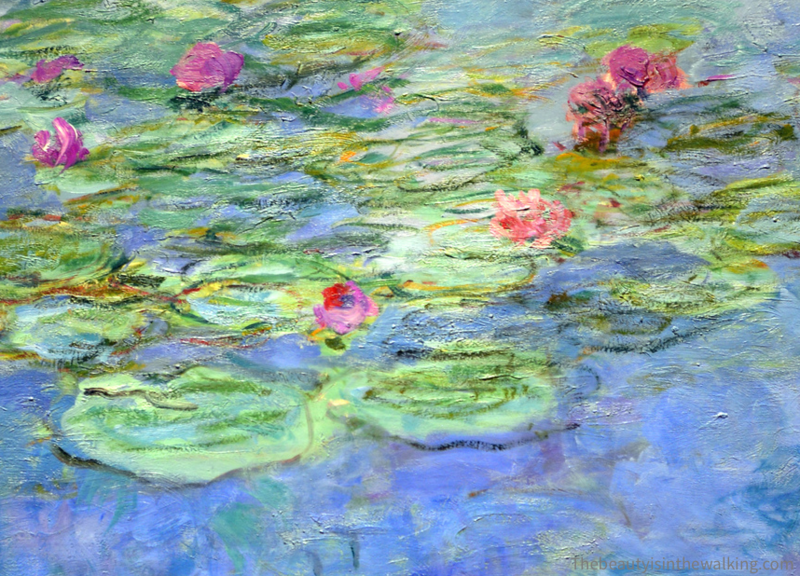 Water lilies, 1906, The Art Institute of Chicago. Et sinon, vous vous rendez compte qu’il y a un monde à sauver là ? ?